Main attachment clamp and adjustment block. The Nostromo arm helps isolate vertical movement from the camera. It is designed for simplicity and ease of use. Weight carrying adjustment is made with one knob. There are no other adjustments or maintenance to be done. All structural parts are machined from aircraft grade aluminium. Axels and other connectors are from 316 stainless steel. The heavy duty spring if formed from titanium alloy. The geometry of the arm allows for easy booming throughout it's range. The main attachment clamp allows for quick adjustment and removal from the vest's attachment post. It also allows the arm to be attached to any structure made from standard 48.3mm scaff pipe/ speed rail. So hard mounting to a variety of powered and non powered vehicles becomes easy. The front end of the arm has a simple quick release mechanism for attaching modules. The Nostromo attached to a simple speed rail rig for a car shot. 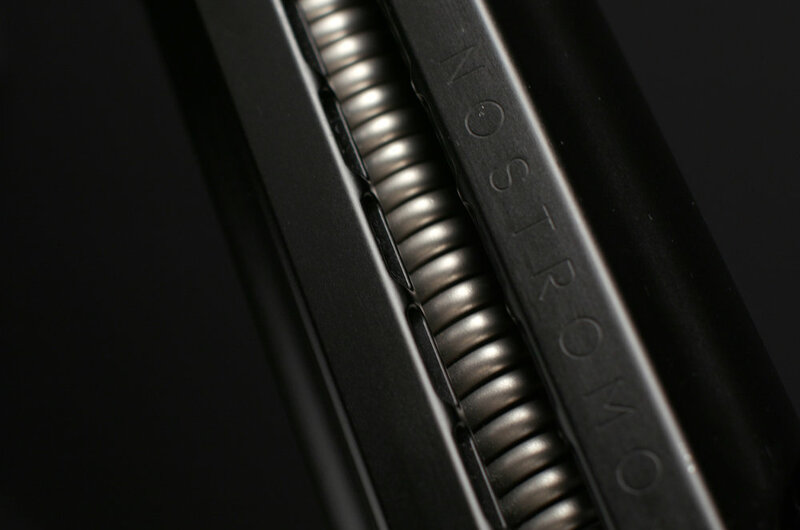 Detail of the Nostromo arm titanium spring.